The church’s full name is Christchurch (Baptist) Welwyn Garden City CIO. 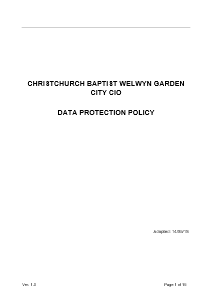 We are the Data Controller for the information you give us, which means if you have any queries about what we’re holding about you, or you want to change or remove it, you can do so by contacting us on 01707 335161 or emailing info@christchurchwgc.org.uk. If you have any concerns, queries or complaints you can contact our Data Protection Trustee on the same phone number or email address. That depends on what it is. When you give us the information we will tell you how long it is held for and why. We will apply national guidelines for retention where appropriate.